Smoking is a filthy habit. It is smelly, unhealthy, expensive, and highly addictive. 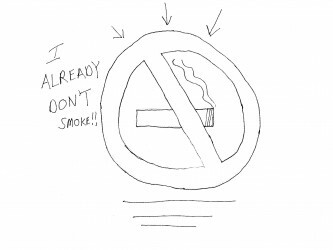 I have known this ever since I was a little kid, because roughly since birth I have been assaulted nonstop by images, lectures, and written warnings illustrating the various health consequences of smoking in particular and tobacco in general. Truth be told, I honestly didn’t need to be given any reason not to smoke. I went camping as a kid, and it was awful when the smoke blew in my face. Why, then, would I ever purposely inhale smoke? (I had similar reasoning behind my decision to wear glasses rather than contact lenses. Sticking my fingers in my eyes twice a day? No thanks. I was very pragmatic as a child.) As a result, I have never once smoked a cigarette, cigar, or pipe. I have never chewed tobacco, snorted snuff, or partaken of any esoteric delivery methods like a hookah or some sort of tobacco suppository, either. I have not learned anything that I need to know about tobacco for over twenty years, so I would like to, at this point, formally request some sort of an opt-out feature for the whole anti-smoking message. Another joyous bit of advertising is the commercial featuring a parade float populated by hospital gown-wearing victims of tobacco related illnesses singing about candy with their incomplete anatomies. Again, don’t click that link if you you aren’t in the mood to see a tracheotomy up close. Ignoring for a moment that it gives me savage case of the heebie-jeebies, isn’t this horribly degrading to the people on the float? “Yeah, I know you guys had to have holes punched in your throats and your jaws removed, but do me a favor and put on the paper dress and let us cart you through town. It’s for a good cause.” I hesitate to imagine a world where, as a non-smoker, I should ever be asked to view a guy with three quarters of a face trying to pronounce the word “cinnamon”. (By the way, I’m not sure it is necessary to physically point to your missing jaw. We noticed, I assure you.) If I was a smoker, this would be a highly effective motivator to kick the habit. As a non-smoker, the existence of this ad is going to give me Vietnam-style flashbacks every time I go to the St. Patrick’s Day parade, and that is a day that’s supposed to be dedicated to alcohol, not tobacco! Bad though those particular PSAs are, the campaign that is giving me the most trouble isn’t a gross out. No, this one is more along the lines of instantaneous depression. I refer to them as the “You will die slowly and painfully” ads. They are full of people dying of lung impairment. I’m not even going to link this one, because I don’t want to bum you folks out. Listening to young people and old fighting an agonizing battle for breath is downright heart wrenching. Yes, I feel sorry for these people, but again, I already don’t smoke. I can’t not smoke any more than I do right now, and no amount of me not smoking will make these people breathe any easier, so can we please find a way to funnel the images and sounds of them more accurately to the people they are intended for? There is a V chip to keep me from seeing graphic violence, sexual content, and coarse language. Surely science can develop some sort of “soul searing images of decay” chip that I can activate. Maybe they can give me special glasses to keep me from having to look at the pictures of people in oxygen masks that are sticking out of my morning paper. I’m sick of eating a bagel while looking at a picture of a man breathing through a hole in his neck. *If you did not heed my warning and clicked, once you’re finished gagging, answer me this: Was that Tony Hawk in that commercial, or what?